Project 1245: S. Werning,S. J. Nesbitt. 2015. Bone histology and growth in Stenaulorhynchus stockleyi (Archosauromorpha: Rhynchosauria) from the Middle Triassic of the Ruhuhu Basin of Tanzania. Comptes Rendus Palevol. 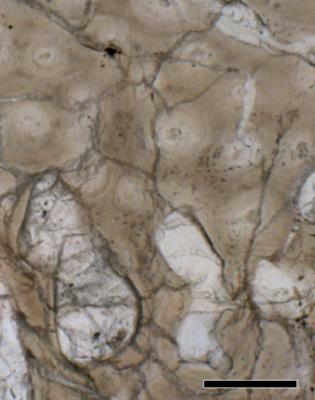 Femur, image from mid-diaphyseal cross section (inner cortex), transmitted light with a single plane polarizer. Section Fe2. Scale = 250 Âµm. This image is figure 3D in the associated paper.